WingerBLOG: 20150901 - Kickin It! 20150901 - Up in the am and dropped D off at school on the way into work. 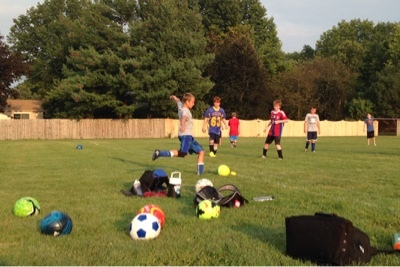 Another day full of exciting meetings... Home and put some food In a box and took J to soccer practice. It was nice to sit and relax and just watch. J did good and is excited to play. After practice we ran to my buddy's warehouse, diabeticfriendly.com, to pick up some stuff we are selling online for him and chatted politics. Home and had an ice cream treat and little boys to bed. D up watching the Indians game texting GmaW.